Reference was made to the Rue du Boyer from the late 15th century onwards. It flanked the south side of the old “Pourpris” which was the neighbourhood set aside for the bishop and his canons. It led to the old Notre-Dame-de-Grande-Puissance chapel, which was once frequented by large numbers of sailors and was knocked down in 1792 because it was blocking traffic. The name “Boyer” seems to be an old name for “Bé”, the small island that it leads to. Moreover, its western end bears the name Rue des Bés. The gate of the same name was only opened there in 1884. 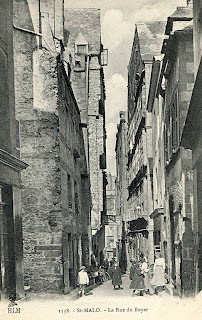 Before 1944, Rue du Boyer was lined with picturesque houses with glass façades, one of which was called “Château des Bigorneaux”. Yann Nibor, the naval singer-songwriter (Saint-Malo 1857 – La Chapelle-sur-Erdre 1947), was born in this street. At No. 5, you can still see façades that bear the date 1714, and at No. 6, there is an old town-house from the 17th and 18th centuries. Furthermore, the western part of the street has retained nearly all its old houses. The gap on its north side was opened in 1809 in order to achieve linkage with the current Place des Frères Lamennais. On the corner of the Rue des Bés and No. 2 Rue Sainte-Anne, there is a plaque pointing out that Marie-Amélie Fristel (Saint-Malo 1798 - Paramé 1866) was born there. She founded the Congregation of the Holy Hearts of Jesus and Mary in Paramé.